2. Remove the fuse box cover by pressing the tap and pulling up. 3. Check the removed fuse; replace it if it is blown. 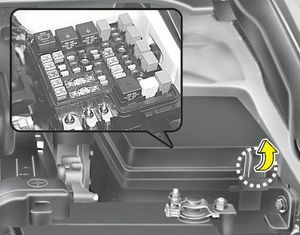 To remove or insert the fuse, use the fuse puller in the main fuse box in the engine compartment. After checking the fuse box in the engine compartment, securely install the fuse box cover. If not, electrical failures may occur from water leaking in.